We have all met that .docx file format lastly introduced by Microsoft in its word processor as much as we have also met the .xlsx file format ( which i covered in a previous tutorial ) for spreadsheets, today's goal would be for us to understand what is that .docx format about and of course, make ourselves a reader for it in C#, are you ready ? 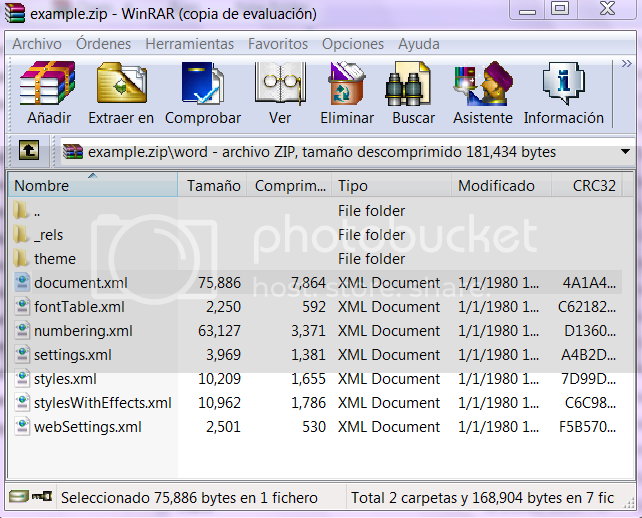 What is a .docx file format ? No other thing than an Office Open XML format, which as its name tell us is an XML file set ( the document file plus support xml files, for templates, formats, tables, configuration, etc ) with one of those XML files containing the actual text document, and the other as aforementioned for decoration, format and culture support. Edited by BlackRabbit, 24 November 2015 - 10:29 AM. Nice information. Will bookmark this for future reference. and take a look to .NET System.XML namespace and methods in case this is your first met with it. 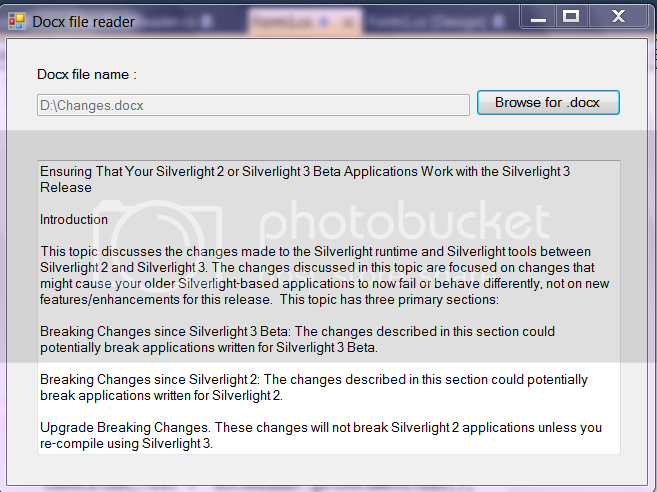 In the attachment you will find the file changes.docx, which is a propper docx file from silverlight, but if we open it with winrar you will find out that there is many files inside it. We are going to focus in the document.xml only in order to extract just the document's text. so basically, we will have to unzip the file, find the document.xml and parse it. lets do it. // not a good node ? // not an element node ? case "t": // its Text ! Just in case, this is the way you call the reader helper. So today we learnt what is all that .docx and open office xml file format, we got ourselves introduced to icsharpcode libs which is very helpful managing zipped files and we learnt how to find our good old word's text content inside all that zipped xml thingie, not bad i would say. so, what do you say ? did you like it ? i hope so, see you in the next tutorial.